CyberConnect2 first started the Little Tail Bronx series with Tail Concerto on the PlayStation back in 1998. Then in 2010, Solatorobo: Red the Hunter came to DS. 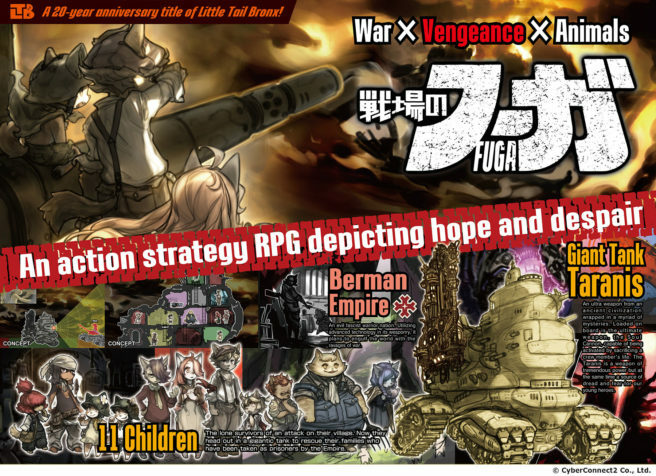 Fuga on the Battlefield will see the franchise return once again next summer. I believe one of the selling points for the Little Tail Bronx world is that it’s very centered the beast-human characters; another is that we release one every 10 years or so, and it isn’t that we’re selling it to the general public, it’s mostly that the audience for it, the players, they always come back for more. So that’s why we release one every 10 years, to answer our fans’ prayers, so to speak. But they’re also able to enjoy a new world and a new concept every once and a while. The reason we have the 10-year wait in between each project is because we do know that if we were to release them more frequently, it won’t sell as well. So our strategy is, in between each project, we build up the community of fans who appreciate beast humans, more people who would enjoy these games. But before that community gets bigger, we can’t release those games more frequently.